After a fun few days in Auckland, it was time for me to fly off to Nadi, Fiji. I had a couple options for direct flights. I could either fly with Fiji Airways or with Air New Zealand. I booked this flight on my own after discovering an interesting fare sale (or glitch?) by Air New Zealand. 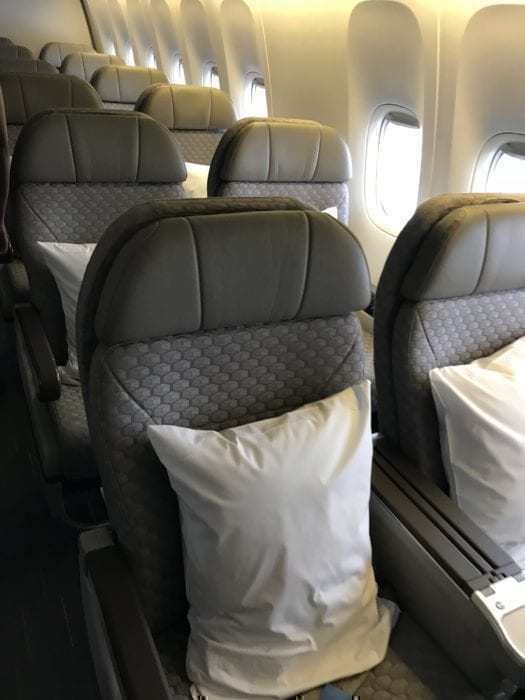 Air New Zealand was selling premium economy seats on NZ52 from Auckland to Nadi for $260. For some reason, this was cheaper than an economy class ticket! So I locked in the fare and was ticketed. The other wonderful thing about this flight was that it was actually not on an Air New Zealand plane. Air New Zealand has been plagued with engine issues on their 787s. To fill in the gap, they leased several planes, including a 777-300ER from Eva Air which was to operate on this route. 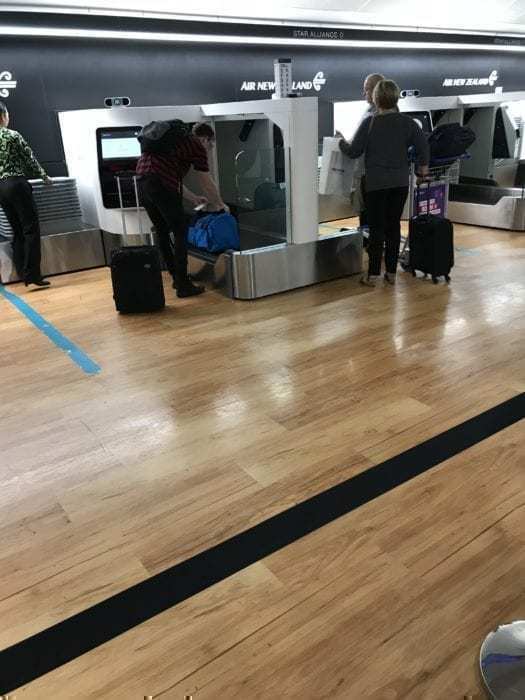 I checked in at the airport, and wow, what an experience that was. Everything was automated and I was through very quickly. Priority Pass members have access to the Strata Lounge in Auckland. I received my Priority Pass membership thanks to my Platinum Card from American Express. When I arrived, the Strata lounge was just about empty. On the scale of lounges, I’d rank this as being below Delta’s smaller SkyClubs in Detroit and above the Aspire Lounge in Amsterdam. There were some food options including cereal, oats, smoothies, and hot options like a spinach and mushroom stew and sausages. I made myself a plate of spinach and mushroom stew, hash browns, and a yogurt mix with fruit compote. The hash browns and mushrooms were served warm and they were quite good actually. The yogurt and fruit mixture was cold and tasted a little funky. When I tried the yogurt by itself, I discovered that it was sour and perhaps a little past its freshness. The smoothie, however, was just downright awful. It can best be summarized by the person nearby who also selected the same smoothie I did. After taking a sip, he spit it out and quite loudly said: “Disgusting!” I don’t know what it was made of, but it was very bitter and had a rough texture. At least the tea was drinkable. Boarding started on time. I’ve never understood why airlines struggle to board passengers. The gate agent announced “NZ 52 is boarding now at Gate 9. All passengers please report to gate 9” at this point, everyone stopped listening while the agent tried to enforce priority boarding. Unsurprisingly, he failed and just let everyone board in a massive rush. Thankfully, most of the people who boarded straight away were economy or business class passengers which left the premium economy cabin mostly empty for pictures and ideal overhead storage. This was an Eva Air aircraft. The plane looked in tip-top condition and I was excited by what the products were like. 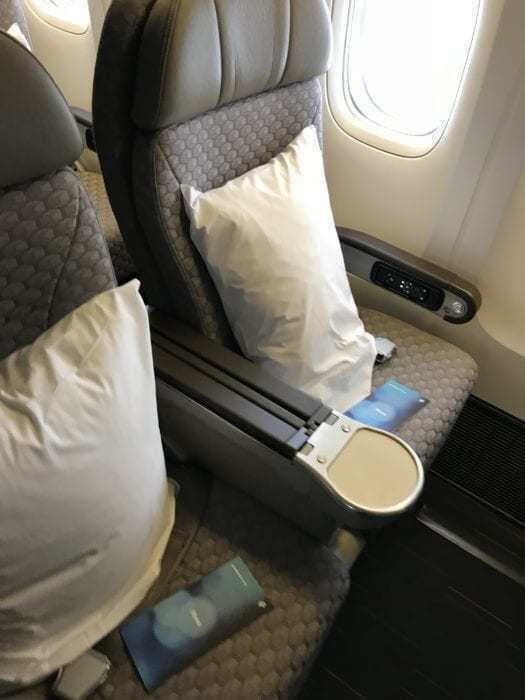 Eva Air’s business class is arranged in a 1-2-1 reverse herringbone configuration and is an upgrade over Air New Zealand’s 1-2-1 herringbone configuration. Premium economy was arranged in a 2-4-2 configuration. My seat for this flight was 23A, a window seat. I settled into my seat and became familiar with the various functions. There was a button for the seat recline and the tray table came out of the armrest. Power outlets and the headphone jacks were located in the armrest. 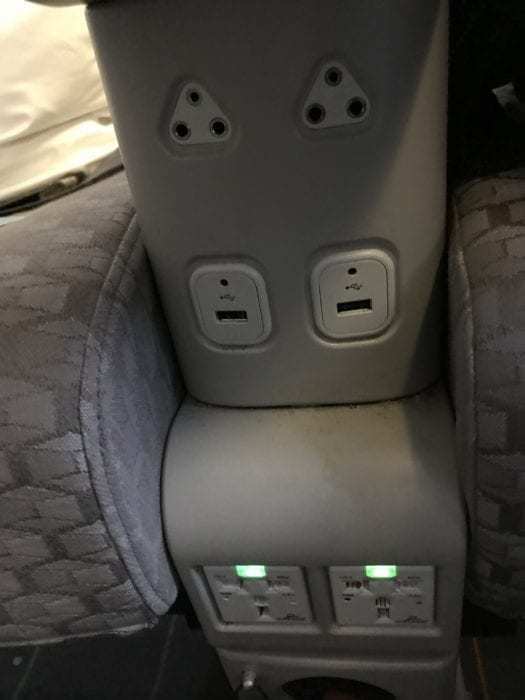 There was one USB outlet and one power port available for each passenger. My USB port didn’t work throughout the flight, but the power outlet worked just fine. There was a remote control in the armrest. 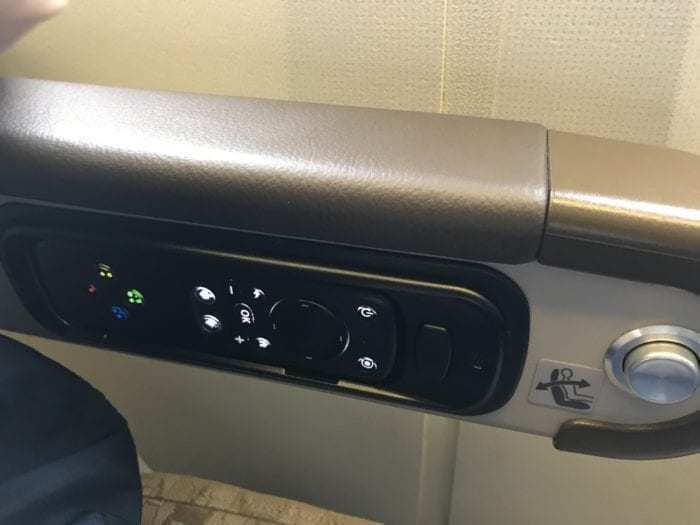 The remote control was located next to the recline button in the armrest. There was a fair amount of legroom and a fold-down footrest. The footrest was a pain to operate and was very difficult to flip down. There was no legrest in the seat. For a short 2.5 hour flight, that was fine. 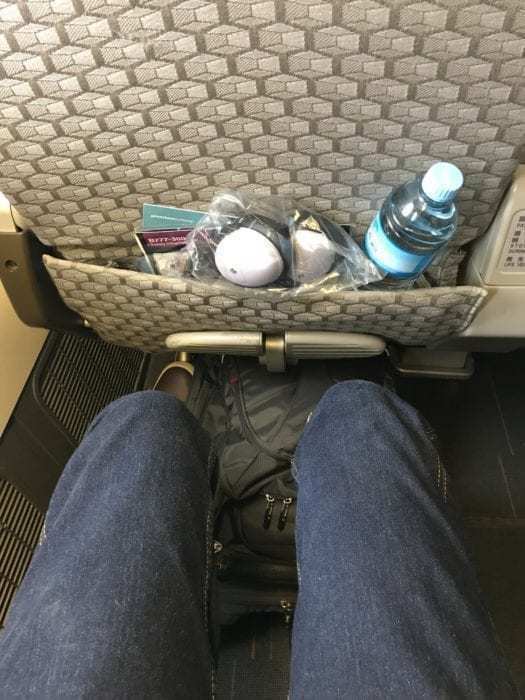 But on a long haul with Eva Air (or with Air New Zealand while they lease the plane), I would definitely find this uncomfortable. Waiting at my seat after boarding was a water bottle and the same set of headphones I received on my last Air New Zealand flight. There was no amenity kit offered. Like the previous flight, the headphones were of decent quality, but were not very friendly with glasses. 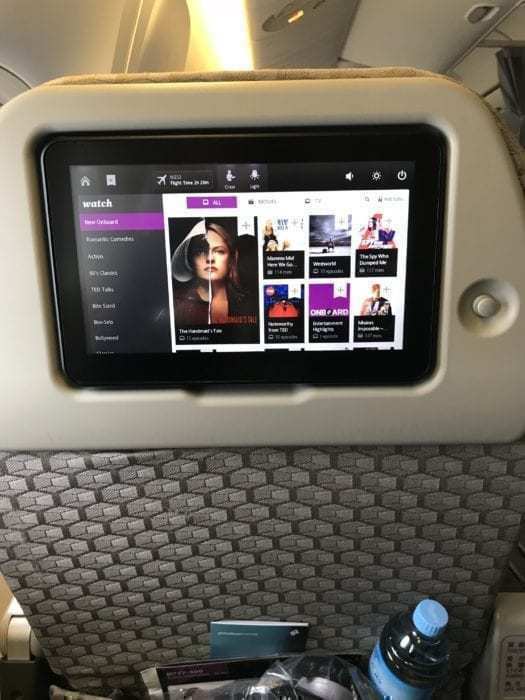 The monitors were loaded with Air New Zealand’s in-flight entertainment content. The monitor itself was a standard touchscreen. 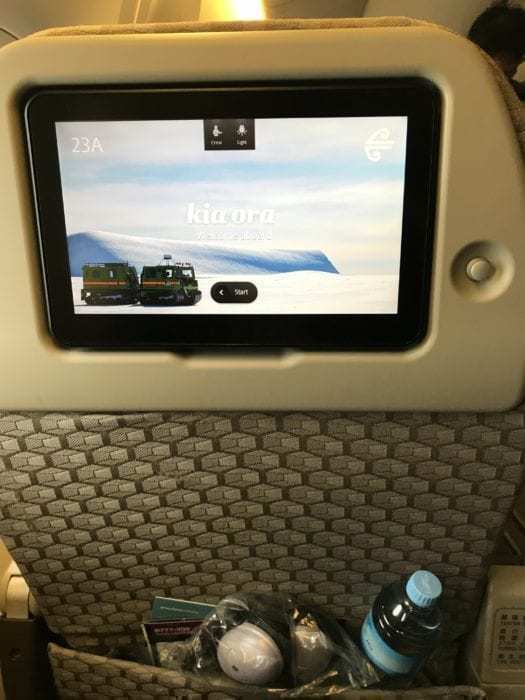 There was not the full range of icons to choose from like my previous Air New Zealand flight, but there was a fully stocked film and audio section. Just like the last flight, Air New Zealand had the same rap-style safety video. Oh my gosh, it was more annoying this time than the last! Since this was not a normal Air New Zealand aircraft, they edited the safety video to fit the descriptions for this aircraft. In a few instances, it got so out of rhythm and tune. I wonder if this was a way to try and get more millennials to fly with them…..if it was, count this millennial out. Shortly after takeoff, meal service started as we were experiencing some moderate turbulence. Just like the last flight, I was served the starter and dessert first on the same tray. The starter was actually quite nice. It was served lukewarm and seasoned just right. It took about forty minutes for my main course order to be taken. 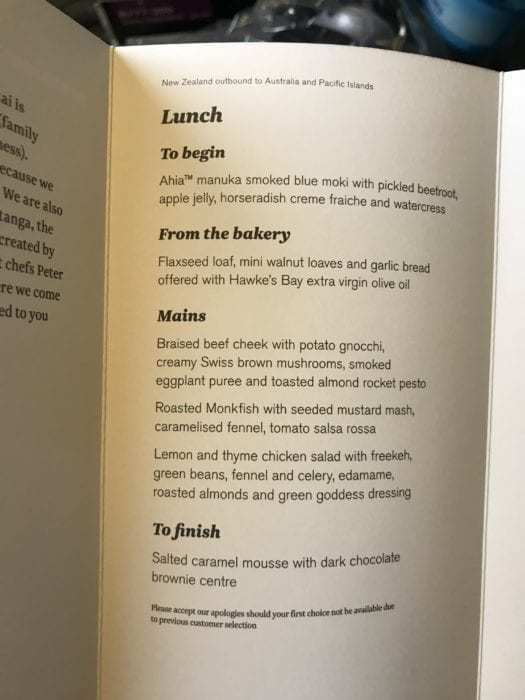 All the Air New Zealand and Star Alliance Elite customers had their meal orders taken while we were still on the ground. For some unimaginable reason, I went with the beef option. I was overwhelmed by the smell. It was absolutely vile! The course was warm and I decided to fight through the smell in order to try the meal out for this review. The gnocchi and mushrooms were great! The beef was actually disgusting. I couldn’t stomach more than a few bites. The dessert was quite good. The cake was just right. Like my last flight, not a ton of exceptional service. It was simple and efficient. This was similar to my last flight. This was a pretty standard premium economy flight. In fact, it was so standard that there wasn’t anything terribly exceptional about the flight. Granted, I wouldn’t want to be on this seat for a long-haul Eva Air flight. 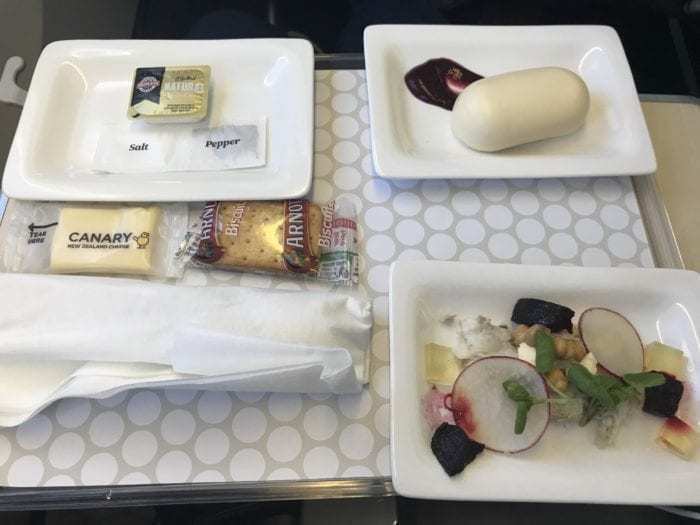 Air New Zealand also could really work on their catering. Ick! That beef wasn’t good. 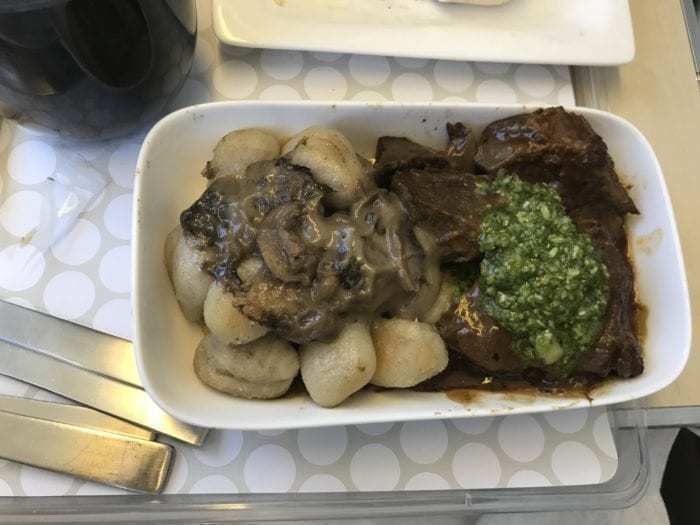 Overall, I’ve been mostly disappointed with Air New Zealand’s food on board. Taking both flights into consideration, unless Air New Zealand has a competitive price option, I wouldn’t be so keen on flying with them again. Have you flown with Air New Zealand? Let us know in the comments! 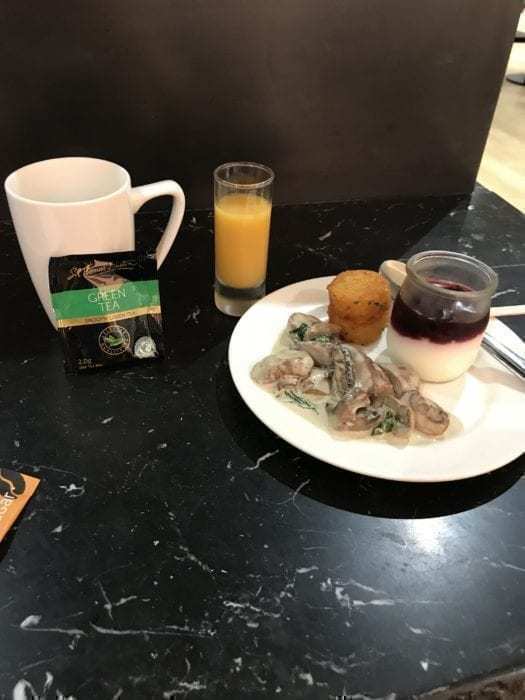 Disappointed to hear about your experience with Air NZ, I’ve always thought of them as quite high quality (in my mind and per the advertisements) but it seems like I was wrong. I definitely had higher expectations given all of the hype around Air NZ. Quite frankly, I think they’re so certain on their current dominance in New Zealand because there are no other major alternatives that would be competitive against Air New Zealand. That kind of dominance means they can erode some of the product. The service could definitely use some improvement. I didn’t feel that warm, Kiwi-type reception that I did across Auckland. I would love to see some more competition come Air New Zealand’s way.